CANNES, France, June 9 — Isabell Werth on her World Cup champion mount Warum Nicht top the field for the Exquis World Dressage Masters starting Thursday and that will include riders from Brazil for the first time, including Luiza Almeida who was the youngest ever dressage Olympian at the 2008 Beijing Games. This glamorous French Riviera resort was the launching pad for WDM two years ago and is now the midway point in the lineup that this year has been enlarged to five premier competitions on both sides of the Atlantic each offering €100,000 (US$119,350) in prize money. The Cannes CDI5* event kicks off Thursday with the €10,000 (US$11,935) Grand Prix presented by Exquis, Lusitano Sport/Elevage Massa. The €30,000 (US$35,800) Grand Prix Special presented by Moorlands and Massa Autopneu on Friday and the €60,000 ($71,600) Grand Prix Freestyle presented by Exquis World Dressage Masters and Groupe Massa on Saturday, will both be at night under lights. Highlights of the event will be broadcast by Sport1 on Saturday, June 19 at 11:45 AM and will be streamed live on the Internet at JumpingCannes.com. It also kicks off the second year of the €25,000 (US$29,840) WDM Rider Award sponsored by Nürnburger Versicherungsgruppe that goes to the combination with the most points won at Cannes, Falsterbo, Sweden, and Hickstead, England in 2010 and Palm Beach, USA, and Munich, Germany in 2011. Edward Gal on Moorlands Totilas was the inuagural winner. Isabell Werth of Germany, who returned to competition at the end of 2009 after giving birth to her son, will be competing at Cannes in her third WDM this year. She finished third on her 2008 Olympic mount Satchmo in Palm Beach in February and third on Warum Nicht at Munich in May. In Cannes, she will ride Warum Nicht on whom she won the 2007 World Cup Final in Las Vegas. She will be joined by compatriots Matthias Alexander Rath, who was the star of the German team at the 2009 European Championships, riding Triviant UNICEF, and Anja Plönzke, also riding in her third WDM this year and who won the Moorlands Grand Prix Special at Cannes in 2009. Experienced WDM competitors on the card for Cannes include three other Olympians. Among the entries are Denmark’s Anne van Olst on Exquis Clearwater; Great Britain’s Dane Rawlins, organizer of the Hickstead WDM, on Sydney; Belgians Jeroen Devroe on Apollo van het Vijverhof and Stefan van Ingelgem on Whitney van het Genthof; Portugal’s Daniel Pinto on Galopin; Valentina Truppa and Eremo del Castegno of Italy, and Poland’s Michal Rapcewicz on Randon. 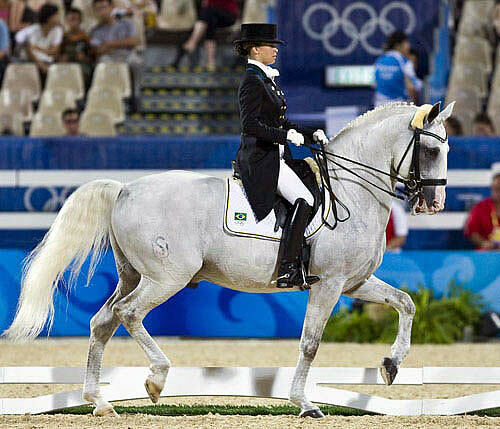 Luiza Almeida of Brazil is a newcomer to the WDM on her Lusitano stallion Samba on whom she competed at the 2008 Beijing Olympics when she was just 16 years old and competed in her first World Cup Final two years later in 2010. The year before the Olympics she was a member of Brazil’s bronze medal team at the Pan American Games in Rio de Janeiro. She is joined by Pan Am Games bronze medal team mate Rogerio Clementino Da Silva who first became a rodeo rider after a humble upbringing in a farm laborer’s home and has become one of his nation’s dressage stars. Belgian’s Johan Zagers, the European trainer of the two Brazilians, is also making his debut at WDM on Question de Liberté. For the home side, Ludovic Martin of France will ride the Lusitano gelding Pastor. Read the diary of Isabell on the road to the 2010 Alltech FEI World Equestrian Games at Isabell Werth Interview for HorsesintheSouth.com & AHorseBlog.com. The World Dressage Masters is a sports and marketing initiative of equestrian innovator Exquis and international sports marketing agency SportBizz. WDM utilizes marketing strategies and innovation to enhance the sport of dressage worldwide. WDM is sponsored by Exquis, Moorland Stables and Moorland Investments, Nürnberger Versicherungsgruppe, Jerich International and Axel Johnson AB group.